Hoi An is not only charming due to its old houses and sparkling colorful lanterns, it is also endowed with the stunning Cua Dai Beach. 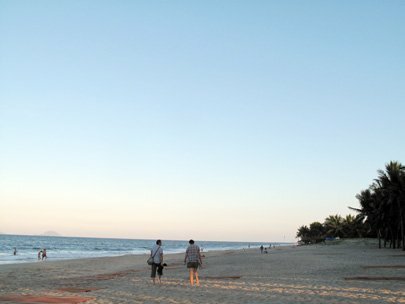 Hoi An is not only charming due to its old houses and sparkling colorful lanterns, it is also endowed with the stunning Cua Dai Beach which is about 4 kilometers from downtown Hoi An ancient town. Spanning 3km, the stunning beach has the most beautiful and relaxing blue water and is a must for any tourist in the area. One thing about the beach that visitors should note is the gently sloping white sand with lapping waves, this is a swimming beach and definitely not one for the surfers. Not really secluded and rarely deserted, the sheer size of this beach guarantees there is a spot for all. Don’t worry about the time, after strolling around the ancient town, you can run out to the beach to clean off the sweat and refresh after a long tiring walk. Also treat yourself to fresh seafood on the beach for a relaxing lunch or dinner. As with almost all Vietnamese beaches, Cua Dai has its fair share of commercialism. Deckchairs, umbrellas, rubber tubes, or plastic or rattan mats can be hired and there is no shortage of food and drink vendors. For accommodation, the phrase ‘No worries’ springs to mind because the beach has a stack of restaurants, hotels and newly-built modern resorts; roads are lined with colorful clusters of wild flowers planted to relax visitors and palm trees lines to give them shade. If you bring the kids, don’t worry as the beach is a stretch of white sand, with moderately salty, shallow water which stays a lovely shade of blue all-year-round, so kids can play on the sand or swim all day long. At night, the surface of the sea is filled with the pinpoints of lamps from thousands of fishing boats, allowing visitors to imagine it as a lantern city on the sea. What more do you want than lying on canvas chairs, breathing in the sea air and waiting for fresh seafood served and admiring the sunset? Try it once and you will see you are like a king or queen having the power to enjoy life and nature in your own time. Cua Dai’s waters are plentiful with sea life, making fishing a popular form of entertainment for tourists. Visitors can hire small boats to go out on the sea and hunt. It may give you the peace and tranquility you need to see your life from a different perspective.